Eco-friendly features are all the rage today as homeowners commit to living greener lives. But for those looking to reduce their carbon footprint, where do you begin? For many, the answer is the kitchen. The central hub of the home, the kitchen offers a perfect foundation for incorporating green features and appliances. Getting started, you may want to consider adding an induction stove, a stove that utilizes magnetic energy to induce a current that heats the food. Not only do pans heat up quickly on this type of stove, but the amount of time needed to cook meals is greatly reduced. In addition to the energy savings and coolness factor, induction stoves tend to be much safer than traditional stoves since there’s no open flame or hot electric element involved. It’s also important to add energy-efficient appliances. If you’re trying to sell your home and an old dishwasher and refrigerator unit serve as the focal point of the room, it could be a major deterrent to a sale. Changing up the lighting is another easy way to up the eco-friendly factor and make the kitchen appear fresh and new. Installing ceiling fans is another simple, inexpensive way toward making the space more eco-friendly. Ceiling fans will circulate warm air in the winter and will help keep the kitchen cool in the summer, keeping heating and cooling costs lower throughout the year. When it comes to greening your home, remember that you don’t need to drain your bank account to find success. For example, adding a water filter to your sink (and saying goodbye to bottled water) is an inexpensive way to promote green living. Take this one step further by highlighting the fact that the water filter removes harmful contaminants, providing a fresh drink that can easily be enjoyed when relaxing at home or while out and about. 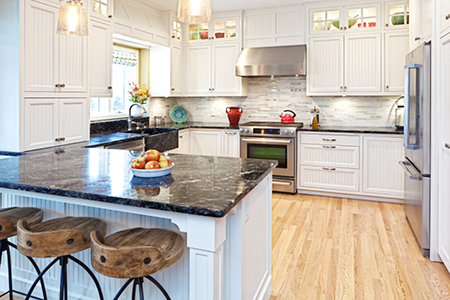 While not every change will yield a payoff, data shows that kitchen improvements will reap the highest rewards in home value, offering the fastest way to get someone interested in buying your home. For more tips on adding eco-friendly features to your kitchen, contact me today!